Young female bachelor kneeling on a start line with a hand give a guide to start her new journey. Photo courtesy of Shutterstock. 2. Figure out how you’ll be using the degree you’ve spent years of sleepless nights and thousands of dollars to earn. Don’t panic. These two tips will get you started in your job hunt. We may be “officially” out of recession but the ground reality is that the job market is still tough. However, what most people don’t realize is that they can dramatically increase the number of interviews and job offers they get, just by making simple changes to their resume and job search strategy. You are looking for work but that is no reason to lose sight of what the employer is seeking in the ideal candidate – the education, the experience and the skill. Many people start their resume with an objective. It is redundant since you have defined your objective by applying for the position. While the company may find it insightful to have the knowledge of your long-term career goals but for them the top most priority is to fill the position with the most qualified and ideal candidate. To be mindful of this fact means a simple key shift in your resume – make it geared towards the employer’s needs and not yours. 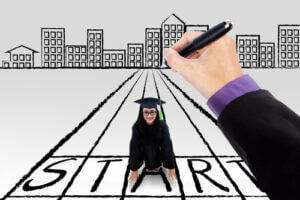 As a recent graduate, you’ll find yourself in a tough competition. Keep in mind, a company creates a job and hires people to solve a problem and/or to capitalize on an opportunity. 2. The hiring manager receives hundreds of applications. It is not a reasonable expectation to think that the manager is thinking, hmm… let’s get Bob his next dream job. a. is Bob suitable for our company? b. Can Bob help us solve our challenges, not just meet our company’s goals but also capitalize on whatever future opportunities may present themselves? So, by addressing an employer’s concerns, you can automatically make your resume one of the top five received for a position. Think about it this way. If you are an employer looking for a chef for your restaurant, would you care if he/she knew how to use Excel? The answer is, no. The same principle applies when you are applying for a job. So, closely read the job posting and understand what the company is looking for and research not just the company but also the industry. Before you start rewriting your resume, ask yourself, do you understand the concerns and needs of the managers who will be reading your resume – if you don’t; you have some work to do. Remember, it is also always important to first identify what your most valuable skills and experiences are, and use them to market yourself properly. Make sure you read all job descriptions thoroughly, that will help you get into the employer’s frame of mind. This way you can determine exactly what they are searching for. Note that these tips will only help in getting you started. Once you’ve done the first steps right, the rest will be less scary. ResumeTarget.com is North America’s top professional resume writing company. We are the only resume writing company that offers a professionally written resume coupled with the guidance of recruiters, to guarantee that your resume will get results.